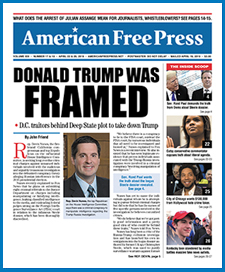 In this week’s edition of AMERICAN FREE PRESS, we are featuring an in-depth look at what we are calling a Brave New World of medicine. It’s an incredible time where the latest technological advances in the field of healthcare are giving Americans control over their own health by taking us to places only once imagined in the pages of science-fiction novels. For example, David F. Williams, Ph.D., a professor of regenerative medicine at Wake Forest University, is convinced that some time in the near future humans will be capable of regrowing fingers and lungs, while also regenerating diseased kidneys. In this same field of study, “tricorder” devices will—from a distance—scan, record and analyze the body’s vital statistics before rendering a diagnosis. Such things as biopsies, endoscopies and invasive exploratory surgeries will be relegated to the annals of history. AT&T helped develop Vitality Glow Cap that lights up, emits a ring tone and sends messages to a patient’s cell phone when they’re supposed to take their medicine. And, even more futuristic, nanotechnology is currently being researched that allows devices to be implanted within a person that, when wirelessly turned on, inject drugs into the body at predetermined intervals. In this sense, a brighter future awaits diabetics, who will no longer have to take daily injections. Dexcom is promoting a high-tech sensor that, when implanted through the skin, monitors glucose levels and then forwards the results to the patient. Are we approaching an era where gadgets will be able to read our minds? That’s precisely what neuroscientist Miguel Nicolelis, M.D., Ph.D. envisions. By connecting the brain to a computer and then downloading its contents, Nicolelis feels that amputees or paralytics will greatly benefit from advances in sophisticated prosthetics that are “reconnected” to the brain via technology. In this same vein, scientists want to entirely decode our brainwaves through complex mind-reading machines. Dr. Philippe G. Schyns, a professor of visual cognition at the University of Glasgow in Scotland, compares this process to everyday household items. Burn victims also face brighter days. With developments in artificial skin that contains nanoparticles of silver that are released over a number of days, infections are greatly reduced. Another technique involves skin printing that is based on the concept of ink-jet printers. In essence, skin cells are carried in a vial and, quite literally, printed onto the damaged limbs of soldiers, firemen or crash victims. Amazingly, these techniques will be performed at the site of an accident, saving valuable time, rather than transporting patients to an emergency room. If surgery is required, so-called “snake-hole” ports will allow doctors to only make one small incision in the body. Like a plumber does through piping, they will feed a retractable “snake” to the critical area to find clogged arteries and other problems. Even those debilitated by Alzheimer’s will be granted greater freedom via personalized GPS sensors that monitor their actions. If an elderly citizen happens to wander off without anyone knowing, the device emits an electronic SOS so they can be quickly located. Taken to its furthest limits, futurist Ray Kurzweil predicts that humans may reach a point where—through interchangeable robotic limbs and organs, in addition to our minds being transferred to super-computers—we can attain functional immortality. Can Technology Replace the Family Doctor? As the former chairman of cardiovascular medicine at the world-renowned Cleveland Clinic, Topol now serves as director of the Scripps Translational Science Institute in La Jolla, California. He was also one of the first physicians to question the safety of Vioxx, a move that ultimately forced that drug’s removal from the marketplace. “Apps” refers to software applications on personal computers, smart phones and tablets. They are computer programs that have been designed to perform specific functions like writing letters or keeping a calendar or even flying airplanes. Topol agrees that the possibilities are nearly endless. This last point hints at the crux of Topol’s argument: the creative destruction of medicine. In Aldous Huxley’s dystopian novel Brave New World, the ruling elite utilized a drug called “soma” to create state-sanctioned cognitive therapy for the masses. If subjects became a bit unruly, or the government needed them to be more supportive of an upcoming war, Big Brother scientists would alter the dosage or the chemistry of the drug. Patients would go to sleep and take a short soma vacation. Eventually, they would wake up after their break, and return to their servile condition and willingly follow the government’s dictates. “In fact, so many people have died from medication overdoses of late that they come to exceed car crashes as the U.S.’s top cause of accidental death – a first since the government started tabulating such data in 1979, according to the LA Times,” she wrote. The negative impact of Brave New World social control extends much further. One trend that stretches around the globe involves the creation of so-called designer babies. Basically, a sperm donor in Britain could find an ideal Eastern European woman who’s willing to donate her eggs—for a price, of course. These “ingredients” will then be shipped to an American lab, where embryos are created. Finally, the test-tube embryos are flown to India and implanted inside a surrogate mother, who carries the child to term. Another chilling development associated with computerized medicine is privacy. As each patient’s personal history is stored in data banks, secrecy will no longer be sustainable. Indeed, similar to hacking into a computer, each person’s most intimate medical secrets will no longer be guarded in a doctor’s filing cabinet, but readily accessible in cyberspace to those inclined to violate one’s privacy. The most grisly example of how sinister this Brave New World has become can be traced to China. There, human baby flesh from aborted fetuses is ground up into a powdered pill form. After being shipped to countries such as South Korea, Asians consume these pills, believing they are a miracle panacea. In early May 2012, South Korean police stumbled upon some 17K pills containing ground-up fetuses that purportedly originated from China. The Chinese have denied that the pills originated there, but authorities aren’t convinced. Although medical science undeniably offers remarkable advances in healthcare, we should also be wary of those who turn this field into a religion, offering up visions of a supposedly better world. When such doctors practice without restraint, their dreams frequently turn out to be nightmares. Victor Thorn is a hard-hitting researcher, journalist and the author of over 30 books.